What Causes Urine To Smell In Restrooms? How can I avoid fragrance overkill in the restroom? If you want to avoid fragrance overload simply select cleaning products that do not contain fragrances. Effective cleaning procedures can help reduce odors from floors, drains and pipes. If fragrances are desired, systems with more balanced delivery may help reduce ‘overkill.’ For example a continuous fragrance system like a gel may not have the same intensity as a metered aerosol at the time of spray. Fragrances with lower or middle notes tend to be less intense. Some examples include fragrances with woody notes, vanilla, and heavy florals. — Nicole Livingston, R&D Technical Manager, Rochester Midland, Rochester, N.Y.
Restroom odors can cause major headaches for facility and janitorial managers, not to mention the discomfort it causes the patrons who use public restrooms. Even with daily cleaning, most public restrooms have very poor airflow, and distinct odors can linger for long periods of time. And no matter how clean a restroom is, if there is an odor, it will be perceived as dirty. However, chemical-based masking agents can create a noxious mix of odors that can exacerbate the problem. It is better to seek out solutions that are proven to fully eliminate odors right at the source. There is a combination of solutions that can eliminate odors without running into ‘fragrance overkill’ issues. For example, air and surface sprays are ideal for rapid, targeted odor control. These solutions instantly bond to, and eliminate, odor molecules in the air, as well as those molecules that are resting on top of surfaces. In addition, gel-based solutions offer a continuous release formulation that works around the clock to provide constant odor elimination, day or night. What’s more, these gels can also be placed in wall-mount units, putting the solution out-of-sight for restroom patrons. We recommend avoiding the use of any solution that is fragrance-based, especially since people’s noses have become more discerning when it comes to using scented products that mask odors; these masking agents merely add to the odor problems. — Amanda Daluga, National Sales Director at OMI Industries, Long Grove, Ill.
It’s important to understand the size of the area that needs odor control coverage and airflow within that area. You then want to match this to your system of choice along with the supplier’s cubic foot recommendation. 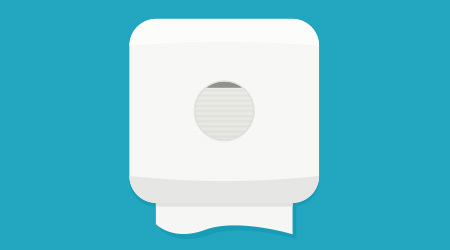 When continuous and consistent odor control is desired, the optimal delivery solution is a wall-mounted dispenser. Typically, metered aerosols cover larger cubic feet and deliver higher doses of continuous fragrance vs. passive air systems or fan systems and gel cups. Passive air and fan dispensers disperse neutral and low fragrant oils and typically have a lower coverage area than a metered aerosol. These examples of wall-mount dispensers that deliver continuous odor control coverage are great solutions for common areas such as lobbies, break rooms, restrooms, hallways and conference rooms. It is also important to understand your supplier’s offering — from both a variety and intensity perspective — and select the right tool for the job. For example, if your facility desires a fruit smell, they would likely want to use something stronger, like mango or citrus, in the larger, high-traffic bathrooms. However, in the smaller bathrooms, they’d want to use a lighter fragrance, such as green apple. — Jarret Chirafisi, Product Manager – Air & Hand Care, Amrep, Inc., Marietta, Ga.